Have a shower cap or bonnet that has lost its elasticity, but is in perfect condition otherwise and you don’t want to discard it out of frugality or for sentimental reasons? Salvage it by using a wide elastic headband (mine is by Goody) to secure the edges! Ahhh… this is a good idea! 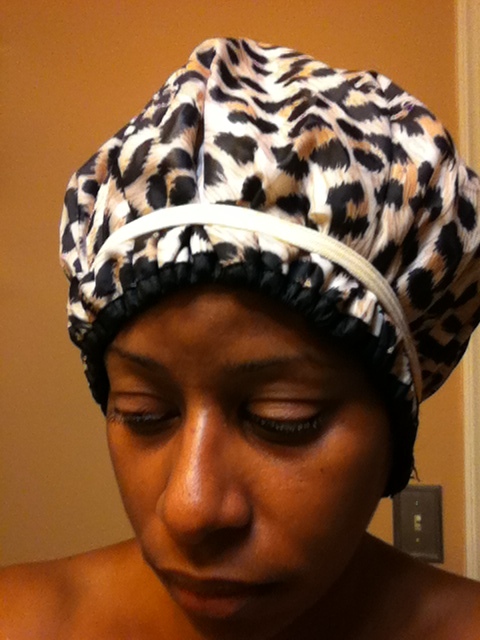 Especially if your shower cap/bonet looks like that! Lawd, going to sleep/shower stylin lol. Maaaan! I JUST threw away my shower cap! I know next time!! Thanks for the idea. you’re a genius! thanks for helping me save money and the environment. throwing these away every year is so wasteful and only adds to our plastic waste and landfills.